As Radiohead embark on a series of shows and festival appearances to support their new album, we find that their support acts are no less interesting than the main attraction. San Francisco-based Holly Herndon is a swiftly rising techno/dance force. She is not entirely new for us either, having delivered favourable performances in the city before. She is now all set to support Radiohead at their Amsterdam, Paris, London and Lyon shows. If there are still any faint doubts about the skilfulness required for electronic music, Holly puts them to rest. Having received an impressive amount of education on electronic music and currently doing doctoral studies on the same, her music is cleverly composed and radiates high levels of perfectionism, a quality that the band she supports and their fans are drawn to. She sounds akin to the DJ sets by Thom Yorke and Nigel Godrich as Atoms For Peace with some added techno flavour. Her live acts are known to integrate visuals with social or political messages. She is one artist determined on mastering electronic music and taking it to the next level. Dawn of Midi, photo taken from artist’s Facebook Page. Dawn of Midi are a Brooklyn based trio. With ‘Midi’ already in the name, they sound like more electronic artists, don’t they? Listen to their music and the assumption is further strengthened. However, Dawn of Midi are actually a trio comprising of Amino Belyamani on acoustic piano, Qasim Naqvi on acoustic drums and Aakash Israni on acoustic double bass. Yes, you read it right. Dawn of Midi is a trio playing acoustic instruments in a rather jazzy setting. It is their unconventional approach to playing their instruments that make them sound like an electronic act. Consider them a minimal electronic act with avant-garde jazz undertones that use only acoustic instruments. Their album Dysnomia was released last summer and received notable worldwide acclaim. As they support Radiohead on their New York shows, many fans will get to witness something fresh and interesting. 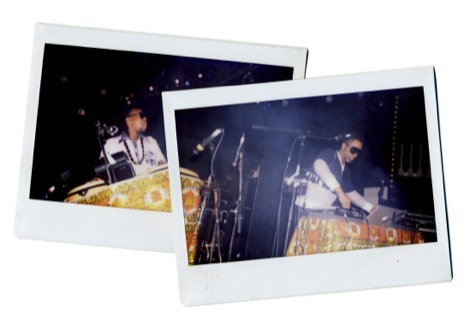 Shabazz Palaces is another act slightly familiar to the city. In fact, if you look around, you might find an artwork based on them at The Constellations. This Seattle based hip-hop duo visited Liverpool long back when they performed at The Kazimier. Shabazz Palaces at first sound like a usual very refined hip-hop duo with their set of sampled loops and sounds, heavy grooves and catchy basslines. However, on further listening you find African rhythms working their way into this hip-hop. Shabazz Palaces stop sounding like just any other hip-hop act. They have a cunning ability of fusing hip-hop with styles like reggae that makes them stand out. The use of live percussion make their live sets even more interesting. They support Radiohead on their L.A. shows. So, it goes to show that just like all their endeavours, even the support acts seem to be Radiohead’s attempt to bring something fresh, unique and interesting to the table.